Detailed map of Hong Kong and the New Territories. Map of the Colony of Hong Kong and New Territory. 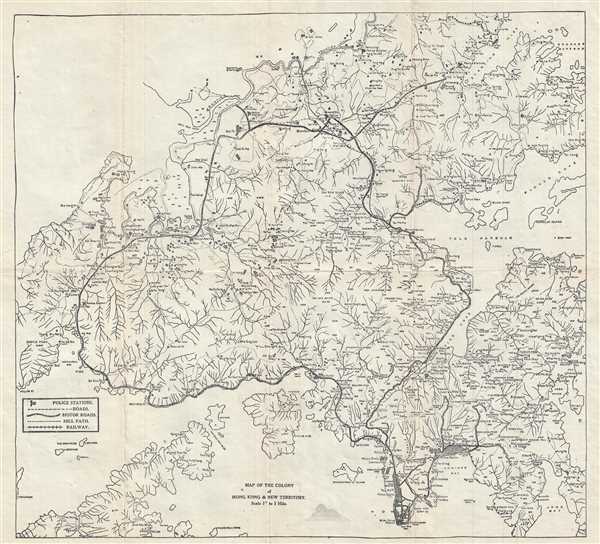 This is a lovely c.1920s map of Hong Kong and the New Territories. Extends from Kowloon and Junk Bay to the Startling Inlet and Crooked Harbor. Incredibly detailed, notes important roads, railways, hill paths, police stations, rivers, hills, important buildings, harbors, surrounding islands, and other topographical features. The map was issued as part of the Tourists’ Guide of the Colony of Hong Kong and Vicinity published by The Publicity and Information Bureau in Hong Kong. Very good. Minor wear and toning along original fold lines. Minor foxing.